کانسار باریت عبدالصمدی، در 80 کیلومتری شمال خاور مریوان، در شمال باختر پهنه دگرگونی سنندج- سیرجان واقع است. واحدهای سنگی رخنمون یافته در محدوده کانسار، مجموعه ای از سنگ های آتشفشانی- رسوبی دگرگون شده با سن کرتاسه پایانی هستند که عمدتاً از واحدهای آندزیت، شیل آهکی و آهک دگرگون شده تشکیل شده اند. این کانسار از دو بخش چینه سان و استرینگر تشکیل شده است. بخش چینه سان کانسار، متشکل از یک عدسی باریتی همراه با کانه های سولفیدی است که بر روی آندزیت های دگرگون (و دگرسان) شده (بخش استرینگر) و در زیر آن واحد شیل آهکی قرار دارد. کانه های سولفیدی ساده و شامل پیریت، اسفالریت، گالن، کالکوپیریت و تتراهدریت-تنانتیت هستند. ساخت و بافت های مشاهده شده در بخش چینه سان کانسار، توده ای، نواری، کلوفرم، فرامبوییدال و دانه پراکنده است، که نهشت کانسار بر روی کف دریا را نشان می دهند. بخش استرینگر، که در آندزیت‌های کمرپایین عدسی باریتی قرار دارد، یک پهنه دگرسان شده است که توسط مجموعه ای از رگه و رگچه های کوارتز- باریتی سولفیددار (پیریت و اسفالریت) قطع شده است. بر اساس مطالعات میانبارهای سیال، که بر روی نمونه های باریتی بخش چینه سان انجام شد، دمای همگن‎شدگی سیالات کانه ساز، در بازه 115 تا 215 درجه سانتی گراد و شوری آنها از 21/0 تا 86/5 درصد وزنی معادل NaCl اندازه گیری شده است. بر این اساس، سرد شدن سیالات گرمابی کانه دار، یکی از فرایندهای مهم در نهشت بخش چینه سان کانسار بوده است. این پژوهش نشان می دهد که کانسار باریت عبدالصمدی شکل ناقص و تکامل نیافته از یک کانسار تیپ کوروکو است که تنها بخش کانسنگ سیاه در آن تشکیل شده است. این کانسار بعد از تشکیل، دچار دگرگونی و دگرشکلی شده و تغییرات محسوسی را در ساخت و بافت کانه ها پذیرا شده است. "کانسار باریت"؛ "چینه سان"؛ "میانبارهای سیال"؛ "کوروکو"؛ "عبدالصمدی"
Abdossamadi barite deposit is located 80 km northeast of the city of Marivan in the northwestern part of the Sanandaj–Sirjan metamorphic zone. The rocks in the deposit area predominantly consist of Cretaceous volcanosedimentary sequences of metamorphosed andesite, calcareous shale and limestone, metamorphosed under greenschist facies grade. The deposit is composed of stratiform ore and stringer zone. The stratiform ore consists of a lens-like barite body associated with sulfide minerals which are underlain by metamorphosed (and altered) andesite (stringer zone) and was under the calcareous shale. Sulfide mineral assemblages of the deposit are simple and consist of pyrite, sphalerite, galena, chalcopyrite, and tetrahedrite-tennantite. Massive, bedded, colloform, framboidal and disseminated structures and textures are common in the stratiform ore and indicate deposition of the deposit on the sea floor. The stringer zone that forming footwall of the stratiform ore is altered andesite that cut by sulfide-bearing quartz-barite veins and veinlets. Fluid inclusion studies indicated that barite samples in the stratiform ore homogenized between 115° and 215°C. Salinities of the fluid inclusions show a range from 0.21 to 5.86 wt.% NaCl equivalent. Cooling of the ore-bearing hydrothermal fluid is an important process in the stratiform ore deposition. This study shows that the barite deposit is an immature Kuroko type massive sulfide deposit, which contains only black ore. The deposit underwent metamorphism and deformation after the ore deposition and therefore, shows significant changes in ore structures and textures. "Barite deposite", "stratiform", "fluid inclusion", "Kuroko", "Abdolsamadi"
بهاروندی، ا.، لطفی، م.، قادری، م.، جعفری، م. و تاج­الدین، ح. 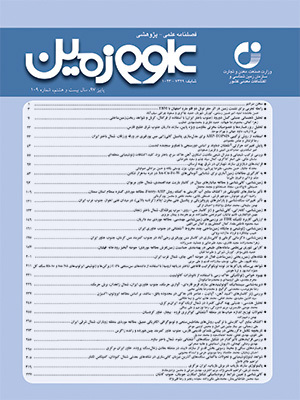 ع.، 1396- کانه­زایی و مطالعات میانبارهای سیال و ایزوتوپ گوگرد در کانسار شکربیگ، جنوب باختر مهاباد، پهنه سنندج- سیرجان. ، فصلنامه علوم زمین، سال بیست و ششم، شماره 103، صص. 201 تا 218. تاج‎الدین، ح. ع.، 1385- کنترل و معرفی محدوده‌های امیدبخش معدنی در ورقه‌ 1:100.000 آلوت، سازمان زمین‌شناسی و اکتشافات معدنی کشور. تاج‌الدین، ح. ع.، راستاد، ا.، یعقوب‌پور، ع. و محجل، م.، 1389- مراحل تشکیل و تکوین کانسارسولفید توده ای غنی از طلای باریکا، خاور سردشت، سنندج- سیرجان شمالی: بر اساس مطالعه ساخت، بافت و میکروترمومتری سیالات درگیر. مجله زمین شناسی اقتصادی، شماره 1، جلد 2، صص. 97 تا 121. حسنخانلو، س.، 1394- زمین­شناسی، کانی­شناسی، دگرشکلی و ژنز کانسار باریت عبدالصمدی در توالی آتشفشانی- رسوبی کرتاسه پسین، شمال­خاور مریوان، پایان­نامه کارشناسی ارشد، دانشکده علوم پایه، دانشگاه تربیت مدرس. شاه­پسندزاده، م. و گورابجیری‌پور، م.، 1385- نقشه زمین­شناسی 1:100000 ورقه باینجوب، سازمان زمین­شناسی و اکتشافات معدنی کشور. یارمحمدی، ع.، راستاد، ا.، محجل، م.، شمسا، م. ج.، ١٣٨7- رخداد طلای باریکا: کانه­زایی تیپ ماسیوسولفید ولکانوژنیک غنی از طلا در ایران. مجله علوم دانشگاه تهران. جلد 34، شماره 1، صص. 47 تا 60. Azizi, H. and Jahangiri, A., 2008- Cretaceous subduction-related volcanism in the northern Sanandaj-Sirjan Zone, Iran. J. Geodyn. 45: 178–190. Azizi, H. and Moinevaziri, H., 2009- Review of the tectonic setting of Cretaceous to Quaternary volcanism in northwestern Iran. J. Geodyn. 47: 167–179. Franklin, J. M., Gibson, H. L., Jonasson, I. R. and Galley, A. G., 2005- Volcanogenic massive sulfide deposits. Economic Geology 100th Anniversary Volume, 523–560. Franklin, J. M., Sangster, D. M. and Lydon, J. W., 1981- Volcanic-associated massive sulfide deposits, in Skinner, B. J., ed., Economic Geology Seventy-Fifth Anniversary Volume, Society of Economic Geologists, p. 485-627. Gu, L. X., Zheng, Y., Tang, X. Q., Zaw, K., Della-Pasque, F., Wu, C. Z., Tian, Z., Lu, J. J., Ni, P., Li, H., Yang, F. and Wang, X. J., 2007- Copper, gold and silver enrichment in ore mylonites within massive sulphide orebodies at Hongtoushan VHMS deposit, N.E. China. Ore Geology Reviews 30: 1–29. Hall, D. L., Sterner, S. M. and Bodnar, R. J., 1988- Freezing point depression of NaCI-KCI-H2O solutions. Econ. Geol. 83, 197-202. Hastorun, S., Renaud, K. M. and Lederer G. W., 2016- Recent Trends in the Nonfuel Minerals Industry of Iran. U.S. Geological Survey, Reston, Virginia, p.28. Marumo, K., 1989- The barite ore fields of Kuroko – type of Japan. In: Non-metaliferous ore fields: M.K Brodtkorb. London (Chapman & Hall), pp.201-231. Mohajjel, M., Fergusson, C. L. and Sahandi, M. R., 2003- Cretaceous–Tertiary convergence and continental collision, Sanandaj–Sirjan Zone, western Iran. J. Asian Earth Science 21: 397–412. Ohmot, H., Mizukami, M., Drummond, S. E., Eldridge, C. S., Pisutha–Arnond, V. and Lenagh, T. C., 1983- Chemical processes of Kuroko formation. Econ. Geol. Monogr. 5, 570-604. Ohmoto, H., 1996- Formation of volcanogenic massive sulfide deposits: the Kuroko perspective. Ore Geology Reviews, 10: 135-177. Pisutha–Arnond, V. and Ohmoto, H., 1983- Thermal history and chemical and isotopic compositions of the ore – forming fluids responsible for the Kuroko massive sulfide deposits in the Hokuroko district of Japan. Econ. Geol., Monogr. 5: 198-223. Roedder, E., 1984- Fluid inclusions. Mineralogical Society of America, Reviews in Mineralogy, 12, 644 pp. Sangster, D. F. and Scott, S. D., 1976- Precambrian, stratabound massive Cu–Zn–Pb sulfide ores in North America. In: Wolf, K.H. (Ed. ), Handbook of Stratabound and Stratiform Ore Deposits, vol. 6. Elsevier, pp. 129–222. Sawkins, El. , 1990- Metal deposits in relation to plate tectonics. Springer-Verlag, Berlin, 461 pp. Shepherd, T. J., Rankin, A. H. and Alderton, D. H. M., 1985- A Practical Guide to Fluid Inclusion Studies. Blackie, Glasgow, 239 pp. Sterner, S. M., Hall, D. L. and Bodnar, R. J., 1988- Synthetic fluid inclusions V: solubility relations in the system NaCl-KCl-H2O under vaporsaturated conditions. Geochemica et Cosmochemica Acta, Vol: 52(5), p: 989-1005. Tiwary, A., Deb, M. and Cook, N. J., 1998- Use of pyrite microfabric as a key to tectono-thermal evolution of massive sulphide deposits - an example from Deri, southern Rajasthan, India. Mineralogical Magazine 62: 197–212. U. S. Geological Survey, 2016- Mineral Commodity Summaries 2016: U.S. Geological Survey, January, 202 p., http://dx.doi.org/10.3133/70140094. Valenza, K., Moritz, R., Mouttaqi, A., Fontignie, D. and Sharp, Z., 2000- Vein and karst barite deposits in the western Jebilet of Morocco: Fluid inclusion and isotope (S, O, Sr) evidence for regional fluid mixing related to central Atlantic Rifting. Economic Geology, 95(3): 587-606. Vokes, F. M., 1969- A review of metamorphism of sulphide deposits. Earth-Science Reviews 5 (2): 99–143. Vokes, F. M., 2000- Ores and metamorphism: introduction and historical perspectives. Reviews in Economic Geology 11: 1–18. Wagner, T., Jonsson, E. and Boyce, A. J., 2005- Metamorphic ore remobilization in the Hallefors district, Bergslagen,Sweden: Constraints from mineralogical and small-scale sulphur isotope studies. Mineralium Deposita 40: 100–114. Wilkinson, J. J., 2001- Fluid inclusions in hydrothermal ore deposits: Lithos, v.55, p.229-272. Zaw, K., Huston, D. L. and Large, R. R., 1999- A chemical model for remobilisation of ore constituents during Devonian replacement process within Cambrian VHMS Rosebery deposit, western Tasmania. Economic Geology 94: 529–546. Zaw, K., Large, R. R., Huston, D. L., 1997- Petrological and geochemical significance of a Devonian replacement zone in the Cambrian Rosebery massive sulphide deposit, western Tasmania. Canadian Mineralogist 35: 1325–1349.